Slaves to the addictive taste of vampiric Vitae, ghouls trade servitude for that heady substance. Servitude, however, damns them far more than they know, as their unnatural craving drives them to ever greater desperation and depravity. Among those known as blood slaves, there's no such thing as "just one fix." 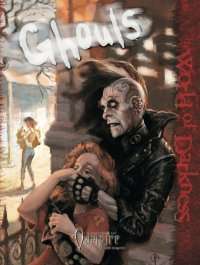 Ghouls examines the life and lot of those who serve vampiric masters. From in-depth rules on being a ghoul, to ghoul families and systems for creating them, to Vitae-fed plants known as mandragora, this book fully explores the effects of the Blood on mortal lives. This title was added to our catalog on May 03, 2005.